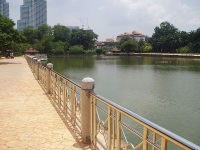 The beautiful gardens were established in 1888 and are Kuala Lumpur's green belt. To many people, their backdrop of skyscrapers is reminiscent of New York's Central Park. Lush vegetation surrounds a vast lake, where visitors will find a number of romantic bridges and plenty of space to read, jog or socialise. Leisurely boat cruises are also on offer. Regarding attractions, Bird Park, Butterfly House, the National Monument, the Orchid and Hibiscus gardens and Malaysia's Parliament House all call the area home. Children can enjoy some wonderful playgrounds. All things considered, the gardens are a wonderful way to escape the city's crowds and humidity. Opening times: Daily 7am to 8pm. Admission: There's a small admission fee for the Butterfly House, Bird Park, and Orchid and Hibiscus Gardens on weekends.